Wilfredo Andujar is married with four children. He works the night shift at Joe’s Crab Shack in Methuen. He attends Northern Essex Community College. The 30-year-old Lawrence resident also plays forward on the men’s basketball team. 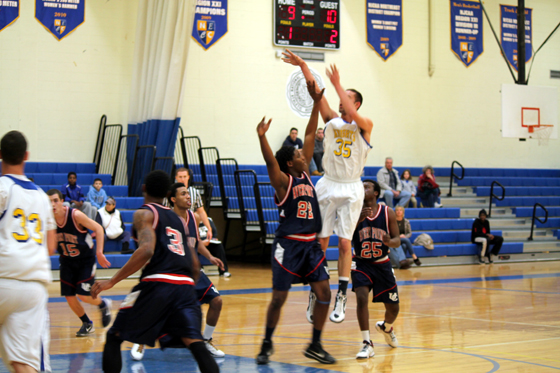 In the season finale, an 83-59 win over Holyoke, Andujar was Wilfredo on-the-spot as he netted a dozen points. While this talented 2012-2013 team – which started the season 6-2 – failed to make the playoffs, both Tardif and head coach Darren Stratton are buoyed by the academic success of his squad’s seven sophomores – which equates to seniors at four-year colleges. They include tri-captains Matt Sifferlen, Kyle Davis and Junior Veras, along with Desmond Obi, Jarvis Castro, James Morgan-Thames and Andujar. “As for goals we always want to make the playoffs,” said Stratton, whose squad finished at 11-15. “But we are more proud of the fact that all these guys are graduating. That’s what it’s all about at the junior college level. Twenty-four-year old Davis of Haverhill is the team’s leading scorer and rebounder. The 6-foot-6 forward averaged 16 points and 9 boards per game. Upon arriving at Haverhill’s college on the Kenoza two years ago, Davis possessed a boatload of basketball talent. But hanging over his head was a prison sentence at Middleton House of Corrections for marijuana distribution. Prior to NECC, Davis entered Haverhill High as one of the most ballyhooed prospects in years. The Nettle School graduate, though, was already “drinking, drugging and hanging out with the wrong crowd.” And school was not a priority. He dropped out of Haverhill High as a sophomore, eventually earning his GED in 2007, the year he was supposed to graduate. Stratton said there was hesitation about allowing Davis to join the NECC team. He was aware of Davis’s pending legal troubles and knew Davis would miss time from school as he served his sentence. “If he (Davis) was coming here just to play basketball, then that was a no-go,” Stratton said. And they have. And in turn Davis has been a model citizen. “He has never once tested us,” Stratton said. “It’s been a rough road and I am still clawing my way back,” said Davis, who ended his career on a winning note. The Knights defeated Holyoke, 83-59, and Quinsigamond, 59-47, in their final two games with Davis collecting 31 points and 22 rebounds in the victories. Davis and his girlfriend have started a family of their own. About 16 months ago, his girlfriend gave birth to the couple’s daughter, Ava Marie. “She’s been the best motivator for me,” Davis said of his daughter. As for the Northern Essex family, it starts at the top. Both Stratton and Tardif are NECC graduates, and assistant coach Nick Nofi rounds out the staff. If life is like a box of chocolates, and you never know what you are going to get – as Forrest Gump’s mom said – then so is coaching junior college basketball. The Knights began the season with great promise, noted Stratton, “We never had this much talent to start the season.” But before the team played a regular season game it had lost Jaylen Alicea, “one of the best guards in New England,” to a broken foot. Two other starting guards were lost after semester break. While winning is always a goal and losing key players is frustrating, Stratton said he “is trying to mold his athletes into young men” and teach them the value of earning a degree to further their education. Davis, who has two years’ sobriety in February, credits the coaching staff and his teammates in helping him stay on the right path. He said if his story of redemption can help save one person, then it’s all been worth it. Love reading about people responding positively to adversity in their lives, even, or maybe especially, when it is self-imposed.